No holiday party is complete without some poor wretch galavanting around in an ugly sweater. Throwing caution to the wind, these people ignore the simple choices. The standard combination of red and green topped with a santa hat is just not enough. With the ugly Christmas sweater, you go big or go home. I didn't know it, but apparently I was one of those people when only 8 years old. I decked the halls of my school with this fashion faux pas. 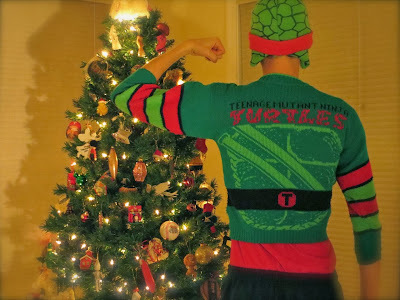 The sweater looks like a witch tossed holiday cheer, Turtle Power, and a dash of ugly in her Christmas cauldron. Despite its elf-like size, it miraculously still fits over my head. Social suicide or hit of the party? Where did I fall wearing this sweater? Anyone from my 2nd grade class reading this? We need answers! Make sure to return tomorrow for Day 5 of 24 Days of Turtle! This for sure would be the hir of the party...well, my party, that is. 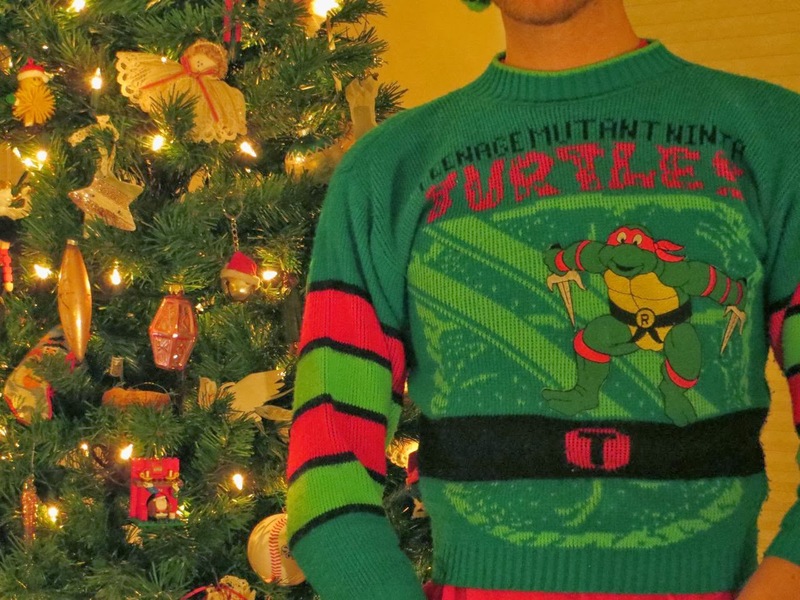 I've seen that newly released 'ugly' Turtle sweater. Gotta get that just in time for Christmas, I need this to be a really good turtle holiday. Will you be wearing this on Christmas Day? Hit of the party! Alright! 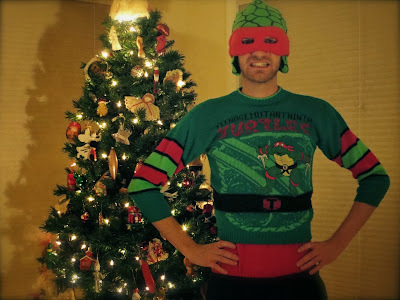 The ugly Christmas sweater definitely has the potential for a Christmas Day outfit. Although, it may frighten people...especially children. That's still pretty sweet. At least the arms and torso areas fit appropriately!